How can I use the tracking service? Log on to www.spytec.com/gps-activation to activate your device. 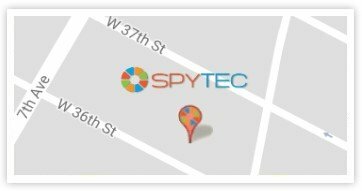 Note: our tracking service and tech support are available only for SpyTec-branded devices. A SpyTec logo should appear on the device. Once you fill out and upload your activation form, you will receive via email your login credentials.You can begin tracking your device online at www.spytecgps.io. An IMEI (International Mobile Equipment Identity) number is a unique 15-digit number listed on the back label of your device. How do I insert the SIM? The SIM card should be inserted in the SIM slot of the device, with the magnetic side facing down. Red Light indicates power. Green Light indicates cell connectivity and Blue Light Indicates Satellite connectivity. Is there a warranty for the GL-300? Yes, we provide Lifetime Warranty on our devices provided it is not damaged by rough handling or water. How can I contact the support team for help? Please go to support.gps@spytec.com for submitting your questions. It is a Verizon portable device. Why do I see my location as New Jersey even though I am in Texas? When the device was first activated, it was located in New Jersey where our head office is located. Once you charge the device and take it for a10-15 minute drive, it will update the current location of your vehicle. The battery life of the device depends on the subscription plan you've chosen and how much of the day that the device is in motion. For example, a device on a basic plan that is moving, on average, one hour per day, has a 10-14 day battery life. That's based on the device updating its location every minute while it's in motion. When the device is stationary, it defaults to updating its location every three hours. A more expensive plan, however, might update a device in motion every 5 seconds, which would reduce the battery life. What is a GPS lock? When there is satellite connectivity it is referred to as GPS Lock. What is the best position for the device to get a satellite connection? The device should have access to the open sky. It's best to place it under the passenger or driver seat or under the dashboard. Make sure there are no metal objects like keys next to the device. How can I know if my location has coverage? How can I become familiar with the tracking platform? What is a Travel Log Report? Travel Log Report is a consolidated report of the movements of the vehicle to which it's attached. To access Travel Log Report go to Report Generation/Travel Log Report after logging into your tracking platform. What is a Track History? Track History is the track of the movements of the vehicle for a selected date range. What is a repeating time signature in the Travel Log Report? When the device is unable to contact the satellite, you will see repeated time entries or signatures in the travel log report. This happens when the vehicle is in a covered garage or building or the device is positioned in the vehicle in such a way that it is unable to connect to the satellite. Why does my tracking platform show Hawaii and a -4242222 hours ago? It is a GPS Lock issue where the device is unable to connect to the satellite. Please reposition the device and take it out for a drive. It should update according to your subscription plan. Why do I see a Chinese address in the tracking platform? The device has either New Jersey, China or the Blue Ocean as the default location. This is true of all new devices. Please make sure it is charged, the LED is blinking once every 3 seconds and you take it out for a drive. It should start updating the current location. You can charge the device using the charger that comes with it or by connecting the USB cable to a USB port on your laptop or computer. What is a geo-fence? How do I create one? A geo-fence lets you draw a circular boundary on a map around an area that you want to monitor whenever your device exits or enters the area. What are the alerts I can get on a phone or tablet? It is only possible to get Function Key, Low Battery and Geo-Fencing alert while monitoring a tracker from a mobile device. Can I temporarily suspend my account? Can I use your tracking service with a device purchased from another vendor? Unfortunately, that is not possible. It is important to note that our tracking service and tech support are available only for devices belonging to us. It should state SpyTec in the label of the device. Why aren't the lights on my device turning on even though I've fully charged it? Please try to charge the device with the charger and USB cable that you were provided or by connecting it to another power source like your laptop. If the device does not charge either way, we can conclude that it is a defective device. In that case, contact us at support.gps@spytec.com and we will ship a brand new replacement device to you. If the device successfully charges through the USB cable, then the problem is a faulty charger. Please contact us support.gps@spytec.com to get a new charger. Why does the red light stay on even after I've unplugged the device from the power source? This means it is a defective device. Please contact us support.gps@spytec.com and describe the issue along with your full shipping address. We will replace your device with a brand new one after confirming that it is a defective device. What are the subscription plans available? How do I choose mine? There are three plans available. Basic provides 1-minute updates, Plus offers 10-second updates and Premium affords 5-second updates. If my mobile app keeps crashing on my phone or tablet, what should I do? Please contact us through support.gps@spytec.com with the mobile device brand and model number (such as Apple iPhone 6) and the operating system (Android or iOS ) version. Sometimes, simply clearing the cache and reinstalling the app can be useful in fixing the issue. Can I get real-time tracking with the mobile app? Unfortunately, we do not support real-time tracking for the mobile apps. Why am I not getting any alerts on my phone? Please make sure that the alerts are enabled on your tracking platform. To enable alerts, please log in to your www.spytecgps.io with your login credentials (given to you in your welcome email when you activated your account) and go to CHANGE SETTINGS/ADD SMS FOR ALERTS. When my carrier is not listed on the tracking platform, what do I do? Please Google email to text, the mobile carrier name. Google will come up with a format which will look like this: 10digitphonenumber@mms.networkcarriername.net Enter this format in the Change Settings/ Add Email for Alerts. How can I reactivate my device? To upgrade your plan go to www.spytec.com/gps-activation and choose the "upgrade" option from the drop down. How can I add devices to my existing account? To add devices to your account go to www.spytec.com/gps-activation and choose the "add to existing account" option from the drop down. The green light on my device is blinking once every second. What does this mean? It means that your SIM is not connecting to the network carrier. It could be a coverage issue with T-Mobile or Verizon or there may be a problem with your SIM. Please contact support.gps@spytec.com for further questions. Why don't I see any information on my tracking platform? Make sure that your device is assigned to a driver. To add a driver, login to your account www.spytecgps.io and go to Change Settings/ Add New Driver. What is the minimum size for a geo-fence? A geo-fence with a radius of at least three-quarters of a mile is optimal. What is the time limit for viewing the history of my account once it's been canceled? It is best to reactivate a canceled account before a year passes. Data archived in an account that has been inactive for more than a year will be deleted. What is the magnetic case? Where can I purchase one? What is the extended battery pack?